Aboriginal Knowledge has become an accepted term for the beliefs and understandings that Aboriginal people acquired through long-term observation and association with a place. It is knowledge based on the social, physical and spiritual understandings which informed the people’s survival. Synonyms include Indigenous Knowledge, Traditional Ecological Knowledge (TEK), Indigenous People’s Knowledge (IPK), or ‘folk knowledge’. If we understand ‘science’ to mean a systematic approach to acquiring knowledge, then 'Aboriginal science' is the science that Aboriginal people developed through empirical knowledge of their natural environment. As is the case with Western science, Aboriginal science is the practical application of theories of knowledge about the nature of the world. Increasingly Aboriginal people blend Western scientific and Aboriginal knowledge, creating niche expertise or unique business opportunities. How can Aboriginal Knowledge help teaching science? Increasing awareness. Students can learn that Aboriginal culture is not limited to stereotypical areas such as arts. Learning how Aboriginal Knowledge reaches out into science extends student's awareness of the depth of this culture. Broader perspectives. Tackling problems with a Western mindset excludes other possibilities upfront. Seeing problems through the cultural 'goggles' of Aboriginal people helps students think out of the box and come up with different solutions. Physics. Aboriginal people developed the boomerang and other sophisticated weapons (e.g. woomera). Astronomy. They knew how the tides are linked to the phases of the moon, while Italian scientist Galileo Galilei was still proclaiming, incorrectly, that the moon had nothing to do with tides . Others had figured out how eclipses work. Maths. In some cases, Aboriginal people had sophisticated number systems . Navigation. How could they traverse this great continent without compasses, but using stars and oral maps? Landcare. Aboriginal people managed country carefully through controlled burning to maximise productivity. They possessed ethno-botanical knowledge linked to specific places and environments. This resulted in fantastically fertile soils . Chemistry. Aboriginal people had an intimate knowledge of bush medicine, and how to treat poisonous plants to make them usable for food or medicine. Warfare. They organised fierce resistance to the British invaders, and sometimes won significant military victories such as the raids by Aboriginal warrior Pemulwuy  or Jandamarra. You might be forgiven for not knowing. The old paradigm of "primitve natives" is still deeply ingrained in Australian society, keeping us from opening to the notion of "intelligent and sophisticated Aboriginal nations" which is closer to reality. 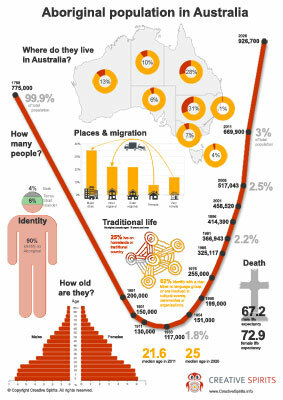 Next time you talk or teach, show that there is far more to explore than the common stereotypes of Aboriginal culture.